Here are a few video selections for you to enjoy. In the “Interviews with Musicians” section I have collected together interviews taped over the years for various TV shows as well as homemade interviews of some of my favorite old timers. You can download the entire Folkways series on your iPod at iTunes. Go to iTunes and put in David Holt podcasts…they are FREE. There is a “How To Play” section that will give you the basics for getting started on several instruments. If you want the full instructional DVDs for Clawhammer Banjo or Folk Rhythms or the CD How to Play the Jaw Harp, go to the store section of this website and you will find them available there. The Doc Watson Videos and David Holt Live are pretty self explanatory. We keep adding to these all the time. 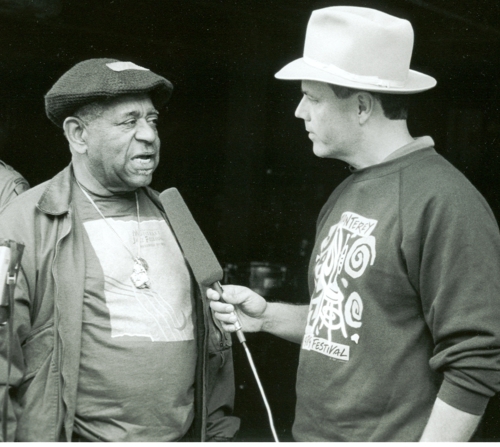 Lastly, I am looking for a video piece I did on the Monterey Jazz Festival with Dizzy Gillespie for TNN’s Celebration Express. Anybody have this on an old video?